July 4th in Boston is awesome. It's definitely one of my favorite times of year. 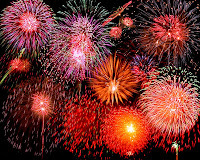 Going to the Hatch Shell to listen to the concert, watching fireworks, bbq'ing - I can hardly wait. I'm also happy because it's one of the few national holidays that I actually get off from work. Anyhoo, Bloggery Reader Sanjay shot me a note asking where I liked to watch the fireworks from. There's a couple of places that are pretty great: If you're a college student (or a hot girl) - spend the next three days befriending guys at one of the MIT fraternities with houses on Beacon Street. Every year, when I was in school, we'd all go up to the roof (which overlooked the Charles River) - bring up a few huge speakers - and watch the fireworks. It was an amazing view. After I graduated, my friends and I sought out some lawn space on Memorial Drive near the MIT library. We had a pretty nice view from there - albeit lower to the ground - and there were food vendors there selling slushies and fried dough. More info can be found (here) at the official event website. 1 Response to "July 4th Festivities in Boston"
Community Boating right by the Charles/MGH T-stop has great views of the fireworks without the crowds, with seats on the dock or on sailboats, BBQ and soft drinks. Unfortunately it is ticketed ($59 each) and tickets are sold out for this year.